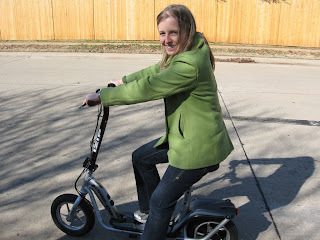 Chip O'Toole's Blog: Erica's New Scooter! My fiance just got a brand new IZIP I-500-CD Electric scooter. She rides it to work everyday now. Just kidding, this is a shot from her visit to Texas to see her Aunt Beth and her family. It's her cousin's scooter, just thought it'd be funny to post this.